The rare species - Orchids and the most endured geneses - roses make for a perfect arrangement. The beauty of both the flowers can mesmerize anyone. 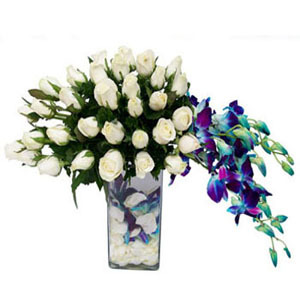 This beautiful and exclusive designer arrangement of beautiful white roses and exotic purple orchids is the perfect gift to entice your loved ones.